is a Shinto shrine located in Sakyō-ku in Kyoto, Japan. It was founded in 859 by the Fujiwara clan. 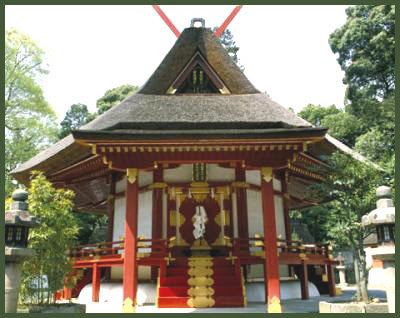 The shrine became the object of Imperial patronage during the early Heian period. In 965, Emperor Murakami ordered that Imperial messengers were sent to report important events to the guardian kami of Japan. These heihaku were initially presented to 16 shrines; and in 991, Emperor Ichijō added three more shrines to Murakami's list — including Yoshida. From 1871 through 1946, the Yoshida Shrine was officially designated one of the Kanpei-chūsha (官幣中社), meaning that it stood in the second rank of government supported shrines. Yoshida Kanetomo, founder of Yoshida Shinto, is buried here. 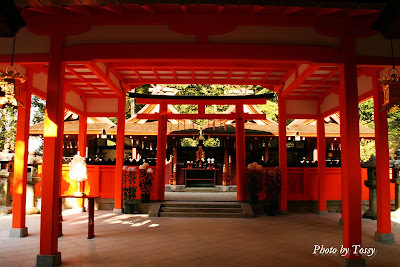 At this Yoshida shrine, people can worship all the Kami of Japan (yaoyorozu no kami　八百万の神）in one visit. From Fenbruary 2 to 4.On the 19th day of the first lunar month, the women got time to go for a special purification ritual. "Yoshida san"　吉田さん is a friendly naming of the Kyoto people.
. Setsubun Festival 節分 (February 3) . 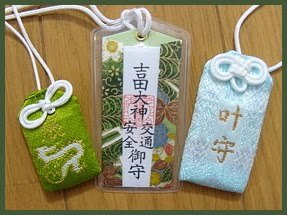 The last day of the year (December 31, oomisoka) and the last day of the first half of the year (June 30, misoka) are specially celebrated with rituals of purification in the Shrines and Temples of Japan. 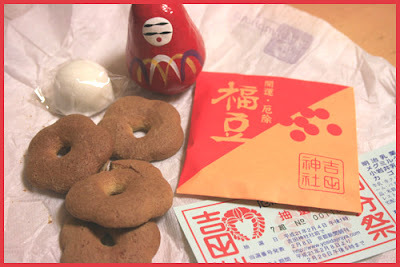 The rituals of these two days are also called "Great Purification" ooharae 大祓.
. Summer Purification Rituals .
. Fortune-telling Daruma だるまみくじ 達磨御籤 . 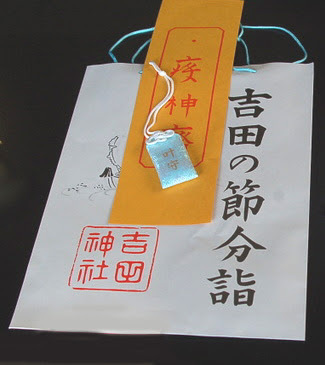 from Yoshida Shrine - in a set for setsubun. Amulet for trafic safety and a safe family. A body of Shinto theory and a tradition that played a central role in kami matters from the late Muromachi through the early-modern periods. The school was founded by Yoshida Kanetomo 吉田兼倶(1435-1511), who called his tradition yuiitsu shintō ("only-one Shintō"), sōgen shintō ("original Shintō"), and genpon sōgen shintō ("fundamental and original Shintō"), but today it is commonly referred to as Yoshida Shintō or Urabe Shintō. The Yoshida house was a branch of the Urabe clan, court specialists in tortoiseshell divination, which originated with Urabe Hiramaro (807-881) from Izu Province. His great-grandson Kanenobu was appointed vice-intendent (jingi daisuke) of the Department of Divinities (Jingikan), and afterwards the Urabe began to occupy this position on a hereditary basis. Subsequently, the Urabe clan split into the Yoshida and the Hirano branches; both specialized, in addition to traditional tortoiseshell divination, in the exposition of classics such as the Nihon shoki (Nihongi) and ancient ritual practices. The Hirano house became particularly active during the Kamakura period with Kanebumi and Kanekata, and came to be called "the Nihongi house" (Taiheiki, fasc. 25). However, the Hirano began to decline in the period of North-South courts (ca. 1336-1392), and in its stead the Yoshida house came to the fore. In the mid-Muromachi period, Kanehiro (1348-1402) was referred to with the honorary title of "elder of kami matters" (jindō no genrō ) (according to Yoshida-ke nichiji-ki); he received the support of the shogun Ashikaga Yoshimitsu and was appointed to one of the highest court ranks. Kanetomo, four generations after Kanehiro, developed his own original Shintō doctrine based on the traditional teachings transmitted by his family over the centuries. Yoshida Kanetomo was born in 1435 as the son of Kanena. In 1467 he was granted access to the imperial palace and was appointed assistant vice-intendent of the Jingikan (jingi gon-daisuke). That year, the Ōnin Disturbance began: the residence of the Yoshida family in the capital was destroyed by fire, and the following year the Yoshida Shrine (present-day Yoshida Jinja) was also burned down during a military operation. But it is likely that Kanetomo began to formulate his Shinto doctrines from around this time; they were first organized in his Sōgen Shintō seishi of 1470, and from the following year he began to perform a Shintō initiation ritual (shintō denju) for several aristocrats. During this time, he built the Saijōsho　斎場所, a ceremonial hall at his residence and transmitted to the imperial court a petition from the shogun Ashikaga Yoshimasa. In 1473 he received authorization to collect a transit tax (called Banzatsu ichigei ichiyaku) to finance the Saijōsho; in the meantime, Kanetomo claimed that the hall would be in charge of the ritual celebrating Emperor Jinmu's establishment of Japan, and was thus the origin of all shrines in the realm. In 1473, Kanetomo likewise chanted a sacred scripture entitled Shinmei sangen godaiden jinmyōkyō, which is now believed to have been authored by him. At this point, his doctrinal system had already taken on a considerable degree of organization. Moreover, beginning from about this time, Kanetomo became very active lecturing on Nakatomi no harae and Nihon shoki, and performing related initiation rituals; in this way, he gained a wide following among the aristocracy, the military, and the Buddhist clergy. In 1476 he even began referring to himself as "the head of Shintō" (Shintō chōjō). Thanks to the support of his followers, he was able to build the Daigengū ceremonial hall on the top of Mount Yoshida in 1484. Around this octagonal edifice he placed replicas of the two Grand Shrines of Ise, the Hall of the Eight Kami (Hasshinden), and other structures containing the more than one-thousand shrines listed in the Engishiki. This marked the completion of Yoshida's doctrinal and ritual Shinto system. An outline of Kanetomo's doctrines can be found in his main work, the Yuiitsu shintō myōbō yōshū, which was probably written around this time. According to this text, the form of Shintō prevalent at the time was characterized by theories of an interrelationship between the "original essences" of sacred entities and their "manifest traces" as kami, (honjaku engi), and by combinatory practices based on the two fundamental mandalas of Shingon esoteric Buddhism (Ryōbu shūgō Shintō; see Ryōbu Shintō); in contrast, Yoshida Shintō claimed to be the original and fundamental form of Shinto (genpon sōgen Shintō), taking for its main deity Kunitokotachi no mikoto, the original and primordial kami (daigen sonshin). The teachings of Kunitokotachi, transmitted exclusively to Tenshō Daijin and Ame no koyane, refer to the primordial condition of the cosmos before the distinction of yin and yang (onmyō fusoku no gengen) and before the generation of the first thought (ichinen mishō no honpon). These doctrines explain the original deity before the separation of the single universal material force (ikki mibun no genshin) and the subsequent process of manifestation of the sacred in this world (wakō dōjin no shinka). The Yoshida Shintō teachings are divided into exoteric and esoteric. The exoteric teachings (kenrokyō) are based on texts such as the Sendai kuji hongi, the Kojiki and the Nihon shoki; they discuss the separation of heaven and earth, the Divine Age, and the genealogies of sovereigns and subjects. 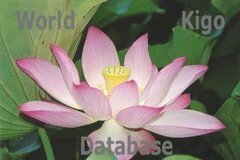 These teachings also include the worship of the deities of heaven and earth (tenjin chigi) and human spirits (jinki), as well as rituals of external purification. 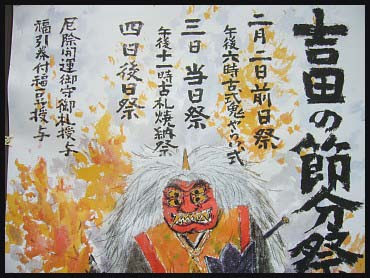 In contrast, the esoteric teachings (in'yūkyō, or on'yūkyō) are based on three scriptures, the Tengen jinpen jinmyōkyō, the Chigen jinzū jinmyōkyō, and the Jingen jinriki jinmyōkyō; these explain the spiritual force of the three entities (sansai no reiō), the three wondrous empowerments (sanmyō no kaji), and the three kinds of sacred treasures (sanshu no reihō); the practices they presuppose aim at internal purification. 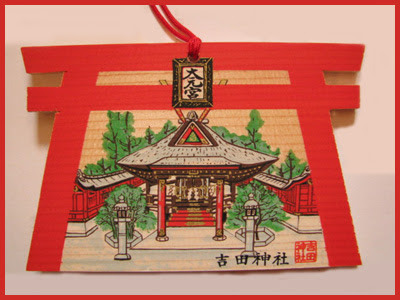 Furthermore, Shinto is divided into substance (tai), function (yū), and appearance (sō); from these, the following series of classifications arises: three principles (sangen, i.e., the previous three items), nine wondrous altars (kubu myōdan, i.e., the combination of the above three with the three elements heaven, man, and earth), and eighteen kinds of Shinto (jūhachi Shintō, i.e., a further, more detailed articulation of the previous nine meant to encompass all existing phenomena). These doctrines are all used to explicate Yoshida Shintō's fundamental principle that Shinto permeates the three entities (heaven, earth, and humans). Kanetomo stressed the originality of the Shinto teachings of his house, and boasted that he "did not drink even one single drop of the three teachings" (namely, Buddhism, Confucianism, and conventional Shinto). In reality, his doctrines included a combination of elements taken from esoteric Buddhism, Onmyōdō, and Taoist thought and religion. Kanetomo continued a tendency already present in Ise Shintō and Ryōbu Shintō, but he carried it out on a much larger scale than his predecessors, to the point of creating a comprehensive compilation of medieval Shintō doctrines through a combination of numerous religious and philosophical positions. This is also true of Yoshida rituals, such as Shintō goma, sōgen gyōji, jūhachi shintō gyōji (collectively known as sandan gyōji), and Hokuto-sai, Anchin-sai, and Tenku-sai, all of which are characterized by numerous elements taken from esoteric Buddhism and Onmyōdō. Finally, Kanetomo had the exclusive authority to confer to the title of kami on humans, and to establish rankings for kami, and also to appoint Shintō priests—authority he exercised by issuing special authorization certificates (Sōgen senshi, Shintōsai kyojō). This authority facilitated the diffusion of Yoshida Shintō throughout Japan. Yoshida Kanemigi 吉田兼右　(1516-1573), who became head of the Yoshida house one generation after Kanetomo's death, began to spread Yoshida Shintō among minor shrine priests in the provinces by issuing many more authorization certificates than his predecessors, and by visiting regional shrines himself. His sons Yoshida Kanemi (1535-1610) and Bonshun (1553-1632) joined the entourages of Oda Nobunaga, Toyotomi Hideyoshi, and Yokugawa Ieyasu, and tried to strengthen the position of their lineage. Their efforts were rewarded later in the Edo period, when the Shosha negi kannushi hatto [Ordinances for shrine priests], issued in 1665, placed all shrines under the control of the Yoshida. However, the Edo period also saw the revival of Ise Shintō and the formation of Yoshikawa Shintō and Suika Shintō, and Hayashi Razan, Deguchi Nobuyoshi, Amano Sadakake, Usui Masatane and others began to criticize the Yoshida version of Shinto. In response to these developments and criticisms, the Yoshida house appointed the Suika scholar Matsuoka Yūen (1701-1783) as head of its academy in an effort to incorporate elements of Suika Shintō; apologetic texts such as the Nihon jingi seitōki and the Shingyō ruiyō were also published to rebut criticism. Yoshida Shintō could not, however, avoid being excluded from the newly arising Shintō trends central to the period; in addition, from the mid-Edo period onwards frequent disputes were encountered with the Shirakawa Jingi Hakke house concerning the control over Shinto shrines. The Yoshida nonetheless preserved their authority throughout the early-modern period until the traditional system of shrine supervision was abolished by the Meiji government in 1868. Yoshida Shrine is alluring, attractive and one of the reasons I came to live in Kyoto. It also happens to be one of the most significant shrines in history, for it was from here that Yoshida Shinto was propagated by Yoshida Kanetomo (1435–1511). Some scholars believe that it marks the first time in history that expression was given to a self-conscious religion called Shinto. The shrine was set up in 859 by Fujiwara Yamakage, who wanted to enshrine in Kyoto the ancestral kami of his clan which were housed at Kasuga Taisha in the old capital at Nara. The hill he chose had long been considered a spiritual place, and the new shrine soon became a favourite of the court (in the tenth century it was chosen as one of 19 shrines to be awarded imperial favour).